Bridges in Galway city provide ample viewing spots for the river Corrib. In the evening, one can find many people stopping while strolling into town to snap a picture. Starting from Lough Corrib and flowing through the heart of Galway, the river Corrib is an essential part of the city. It not only provides a great view, but entertainment and necessity (such as the famous Irish salmon). 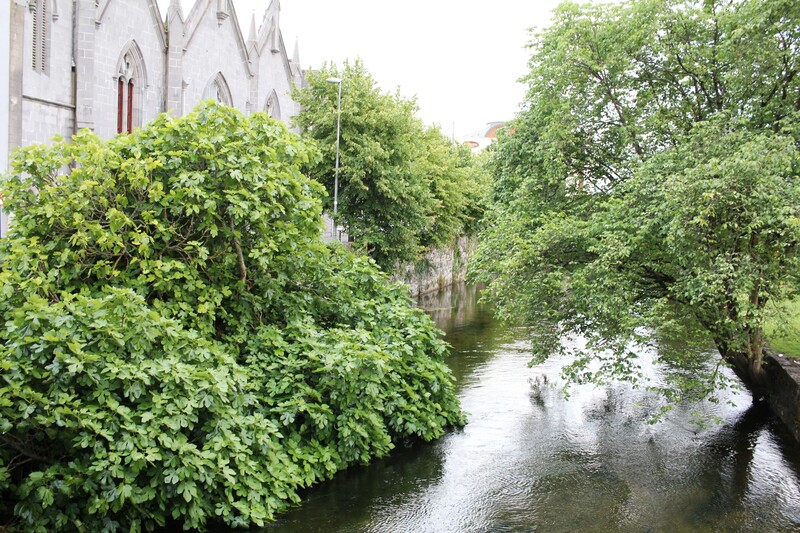 The river reaches to the Atlantic by way of Galway Bay, ending up one of Europe’s shortest rivers at 6 kilometers. 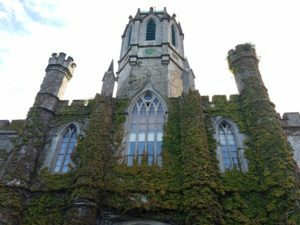 Cathedral of Our Lady Assumed into Heaven and St Nicholas, also known as Galway Cathedral, was built right along the river Corrib. This green-domed, Roman Catholic, Cathedral is one of largest buildings in the city. The river is also an essential part of campus life at the National University of Ireland, Galway. Running right along the campus, there is easy access to the river and all it’s benefits. The NUI Galway Quadrangle was opened in 1849. Despite all the changes the university has seen since, it has remained an icon, showcased in their logo. 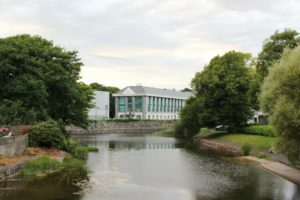 NUI Galway’s Martin Ryan Institute, a state-of-the-art Marine Science building, can be seen from the River Corrib. 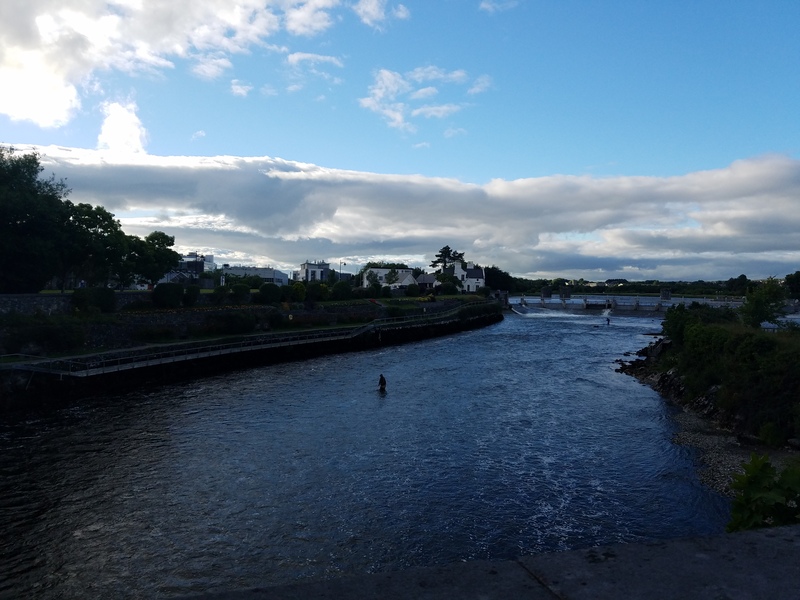 Different kinds of boats often glide along the surface of the river Corrib, including those of NUI Galway students on the rowing team, small ships for dinner cruises, and boats for sport like in the video below. 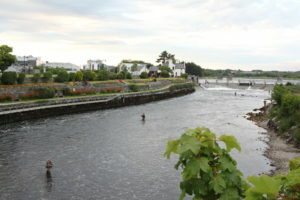 The Galway weir, used to control the water levels, makes Galway a popular spot for in-river fishing. Fishermen reserve spots to stand in the Corrib and try their luck at catching some salmon. Fly fishing is the most popular method here. Fishermen stand tall in the River Corrib with the Galway weir close by. The weir contains 16 hydraulic gates.